A penalty miss from Jonte Smith with the last kick of the game meant that Lewes had to settle for a 0-0 draw with Margate after a game of few clear-cut chances on a bitterly cold night at the Pan, reports Tom Harper. Darren Freeman made one change to the sidd that beat Wingate & Finchley 4-2 in their previous game, with Leon Redwood replacing Charlie Coppola in the starting line-up. Freeman was also able to include Dayshonne Golding on the bench on his return from suspension. There were few chances of note for much of the first half, with both defences proving difficult to breach. The best of the chances that were created fell to Margate though, with Lewis Carey forced into a smart save to deny Bradley Stevenson, before both Alex Flisher and David Smith missed the target from close range within a few minutes. Despite this, the first clear-cut chance of the half fell to the Rooks, who saw Louis Wells save bravely at the feet of Luke Blewden after he had initially only been able to parry a Kieron Pamment strike from the edge of the area. The visitors should have taken the lead with their best chance of the half just before the break, but saw Ben Swift blaze over the crossbar from close range after the Lewes defence had been unable to clear a dangerous corner. The Rooks started the second half brightly, with a goal-bound Omarr Lawson strike being blocked by a covering defender after good work down the left by Pamment. The introduction of Dayshonne Golding just after the hour gave Lewes more pace going forward, and he played a number of dangerous crosses into the area that couldn't quite be converted in front of goal within minutes of coming on. 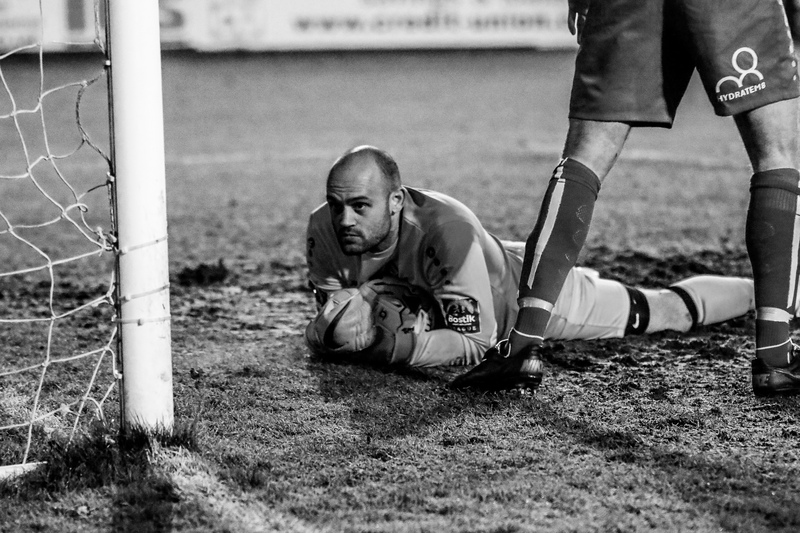 The task facing Margate became more difficult with 15 minutes remaining, as Flisher was forced off injured a matter of minutes after the visitors had made their final two changes, meaning they would have to finish the game with ten men. Lewes enjoyed plenty of possession during the closing stages but were unable to get in behind the well-organised Margate back four until the first minute of injury-time, when Golding forced a fine save from Wells after a purposeful run through the middle. Just when it seemed as though the game would end with no further incident, the Rooks were awarded a penalty when substitute Callum Overton was inexplicably pushed in the back in the area. Jonte Smith took the penalty but saw his tame spot-kick comfortably saved down to his right by Wells, with referee Gerry Heron blowing the full-time whistle as soon as Wells had the ball in his grasp. This was a disappointing end to the game for Lewes, although a draw was probably a fair result on the balance of play, with defences undoubtedly on top for the majority of the game. After the game Assistant Manager Ross Standen spoke to Barry Collins. Full highlights of the game can be viewed here whilst James Boyes's moody pictures can be seen here in all their glory. The Rooks will hope to return to winning ways when they visit Harlow Town on Saturday, kick-off at 3pm. Lewes: Carey, Redwood, Day (Golding 61), Oluwatimilehin (J. Smith 80), Chappell, Freeman, Reed, Lawson, Blewden (Overton 84), Hammond, Pamment. Margate: Wells, Paxman, Mills, Rogers, Friend, Swift, Stevenson, Dymond (Barnard 44), D. Smith (Martin 73), Collin (Sollis 73), Flisher.